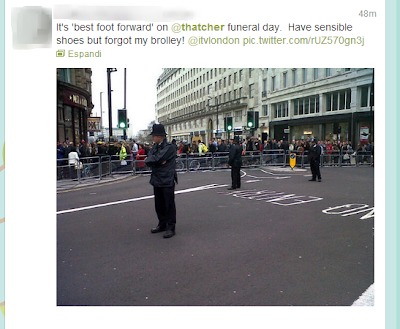 AccuraCast SearchStarz Blog: Thatcher's problem on Twitter. Last week, on the 8th of April, ex UK Primer Minister Margaret Thatcher died. 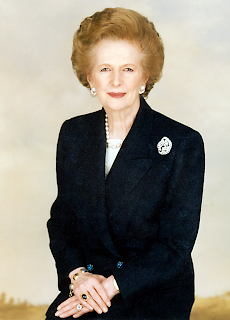 Due to her severe measures she was known also as the "Iron Lady". She was in power between 1979 and 1990, and was Leader of the Conservative Party from 1975 to 1990. In her life she was loved and hated simultaneously by many people and her death has found popularity in social networks, proving that even after death she remains one of Britain’s most controversial characters. Let's see what has happened in the Twitter world in the past 2 weeks. According to Topsy Statistics, in the last 2 weeks there has been a significant number of Thatcher posts made by the Twitter population. In fact around 94,000 of #Thatcher tweets have been registered in the last 7 days. Analysing the graph below, we can see that one of the most significant moments occurred on April 8th around 11.40 am, with 286,898 mentions. He is not wrong, in fact Topsy Statistics tells us that in the last 9 days - considering only the most significant and valid mentions - @Thatcher has been mentioned more than 112 times!